Brush the peppers with oil, place in a grill tray. To grill: Charcoal/gas/electric grill: over/on a medium heat (approx. 200°C) for approx. 20 mins., turning occasionally. Allow the peppers to cool a little, cut into strips and transfer to a plate. Mix the balsamic vinegar with the honey, garlic and thyme, season. Pour the sauce over the peppers, mix everything together and set aside until ready to serve. Season the racks of lamb. To grill: Charcoal/gas/electric grill: over/on a medium heat (approx. 200°C) for approx. 7 mins. on each side. Cover and leave to stand for approx. 5 mins. before serving. 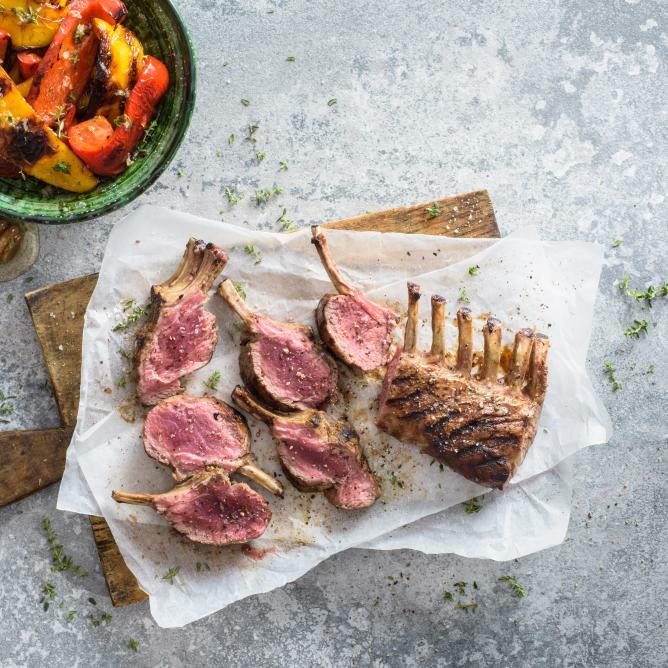 Carve the racks of lamb, serve with the peppers. Garlic bread or herby baguette.